In a volatile Bus Industry environment, we are mere facilitators for external operators/parties who happens to be the real service providers/fleet runners. Because of unforeseen/unavailable reasons, these external operators/parties cancel their specific bus services at the last minute and we also happen to get the information in the last minute or even to the extent of hearing sometimes from the customers. To avoid confusion for customers, we specifically publish the list of cancelled services in our website where no other competitor does (list consists of only services which we have confirmation from external operators/parties). This real time data helps customers to a large extent in planning their alternatives well in advance. No need to worry about bus running status on particular day. Get list of buses that are cancelled by bus operators by using service cancellation list. 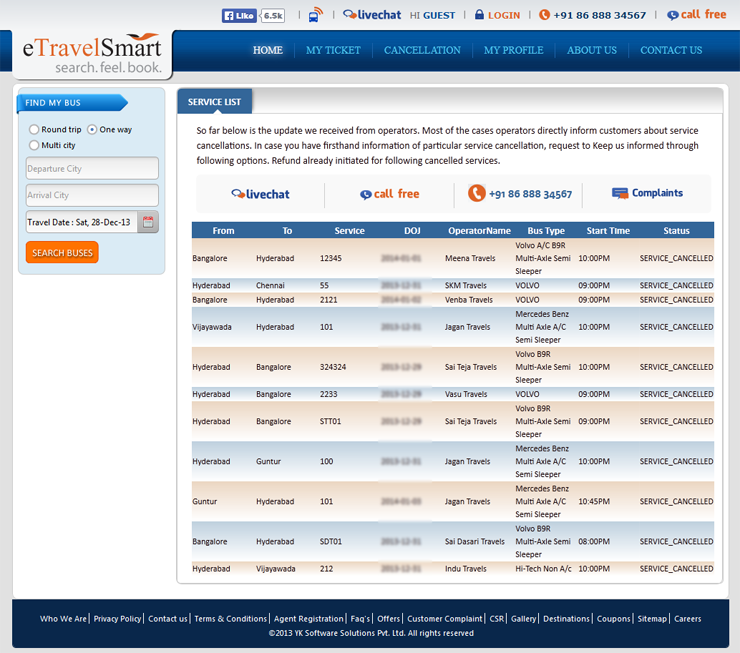 Access list of service cancellation bus list from our smart features page.